Ideal for electricians and electrical contractors, the wireless enabled PT-E550WVP is our flagship electrical label printer. Simply and quickly create durable labels for electrical installations using the easy-to-use, built-in labelling functions. 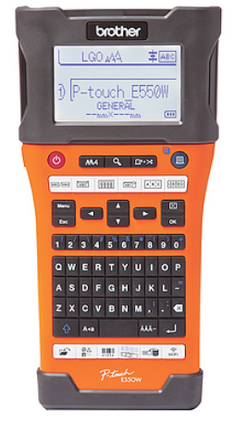 The P-Touch PT-E550WVP takes compliant electrical labelling to a new level of productivity with seamless wireless connectivity to PC’s, laptops, and mobile devices and is an indispensible tool for all electricians and datacom installers. It comes complete with a lithium-ion rechargeable battery and AC adapter, all housed in a durable carry case. Smart technology, QWERTY keyboard, automatic cutter and a large backlit display helps make the PT-E550WVP easy to use to print wider labels for marking cables, fibre, wire, faceplates, patch panels, punch blocks and more. The PT-E550WVP also uses the new heat shrink tape (HSe) in addition to the durable TZe laminated tapes. Leave a professional impression by creating high quality labels for your installations.